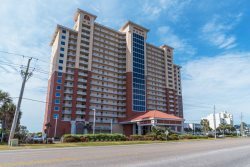 Located on the lagoon on the west side of Gulf Shores is the perfect vacation spot...Rising Tide! You will fall in love with the convenience of the location, away from the crowds but close to all things fun! This 3 bedroom home sleeps up to 10 guests and provides lots of privacy. On the top floor is the spacious master suite with beautiful views looking over the lagoon. The master bathroom is large and offers a garden tub and separate walk in shower. On the main floor there are 2 bedrooms, a fully stocked kitchen with a bar and dining area, a living room and a sun room with plenty of seating. There is a balcony and a downstairs screened in porch where you can relax and watch the colorful sunrises and sunsets over the lagoon! There is also a cozy breezeway for additional sitting and relaxing the day away. The extended pier leading to an upstairs sundeck allows for hours of swimming and fishing for all ages. Bring your boat or rent a jet ski and tie up without having to re-launch everyday. Rising Tide is just a couple of miles from The Hangout and other favorite restaurants. It is only a short 10 minute walk to the sugar white gulf beaches. This property is also pet friendly so book now and pack your family and your pet! There is a downstairs room with 2 twin beds, a full bathroom, refrigerator, washer and dryer that can be reserved for $69 per night. One of the best rentals on the beach! House was very nice and VERY well equipped. I have stayed in several rentals along the beach and this one by far is in the top 3. Lots of room, amazing views, updated kitchen. I highly rate this rental. Quote does not include pet fees. You must add on this option if you are bringing a pet. ($100 per pet - non-refundable) If you are bringing more than one pet you must change the quantity to the number of pets you are bringing. Quote does not include the $69/night downstairs guest room fee. You must add on this option if you choose to include that in your stay. You must select the number of nights for all the nights you are staying.